The Friendly Sons are proud to continue to support The Ivins Outreach Center. 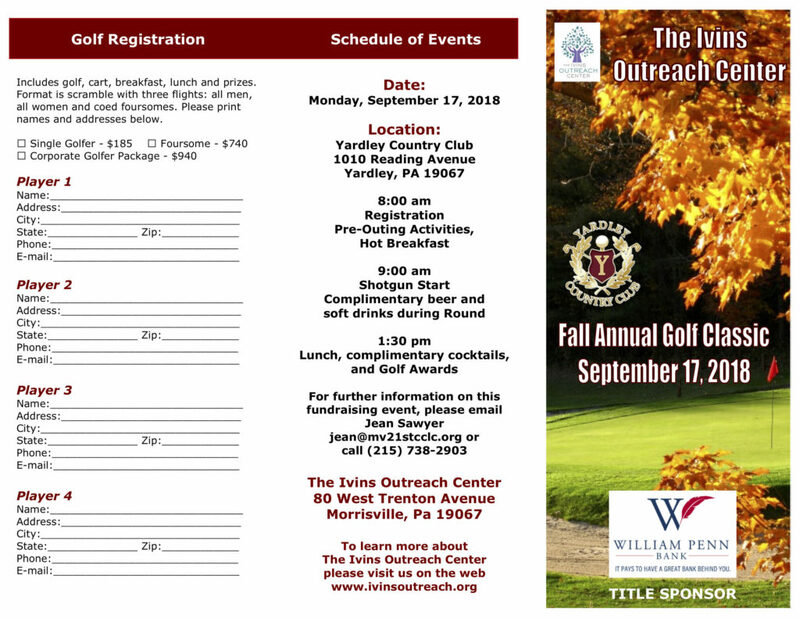 Proceeds from this event will benefit Ivin’s community outreach that provides quality of life programs for youth to older adults in Lower Bucks County. The Friendly Sons are proud to be a Corporate Sponsor for the Irish Immigration Center’s 3rd Annual Golf Outing. 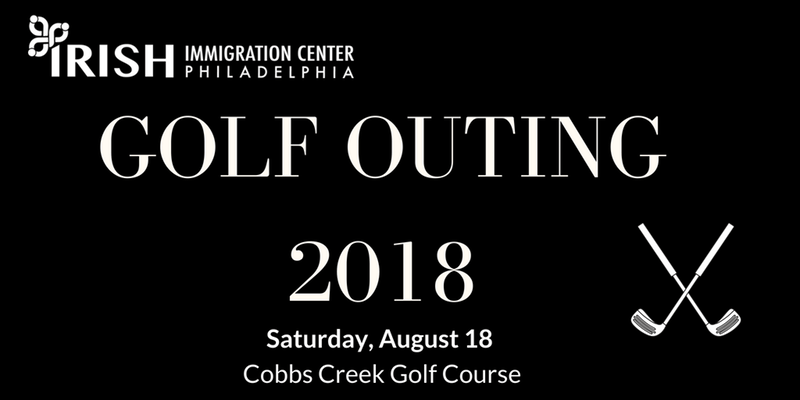 All proceeds from this event will benefit the IIC’s work to support Irish immigrants, promote citizenship, support for older community members, and hosting a variety of social, cultural and educational programs each year. Donate now to help support the Society’s mission! RESTRICTED DONATION ACCEPTED BY THE SOCIETY OF THE FRIENDLY SONS OF ST. PATRICK FOR THE RELIEF OF EMIGRANTS FROM IRELAND. The payments will be $25,000 per year starting in 2016. 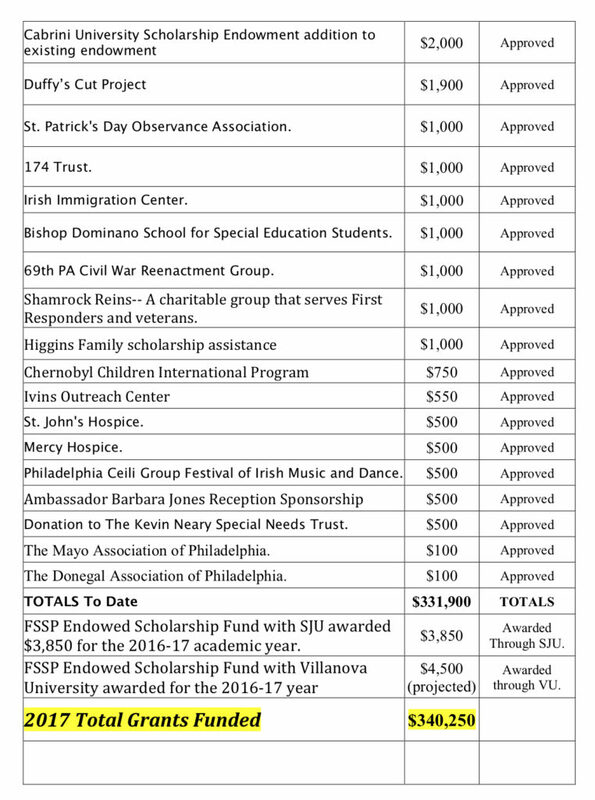 The first payment in 2016 will be used for two $12,500 matching grants by The Friendly Sons of St. Patrick to establish $25,000 endowed scholarship programs at both Immaculata University and Cabrini University. Note: Both schools accept endowments starting at $25,000. Both endowments will be in the name of The Friendly Sons of St. Patrick. 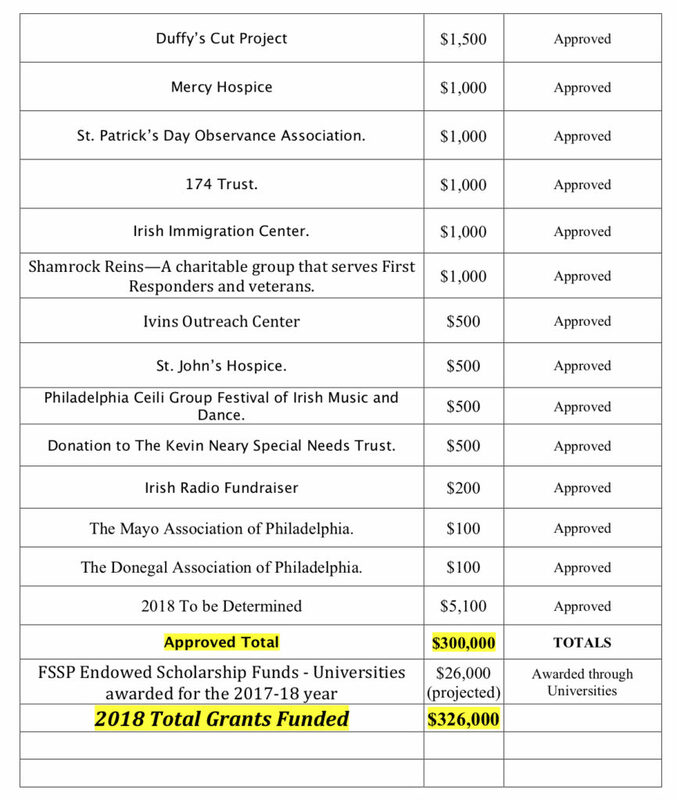 The Immaculata University endowment name shall be The Society of the Friendly Sons of St. Patrick Endowed Scholarship Fund In Memory Of The Irish Souls Of Duffy’s Cut. 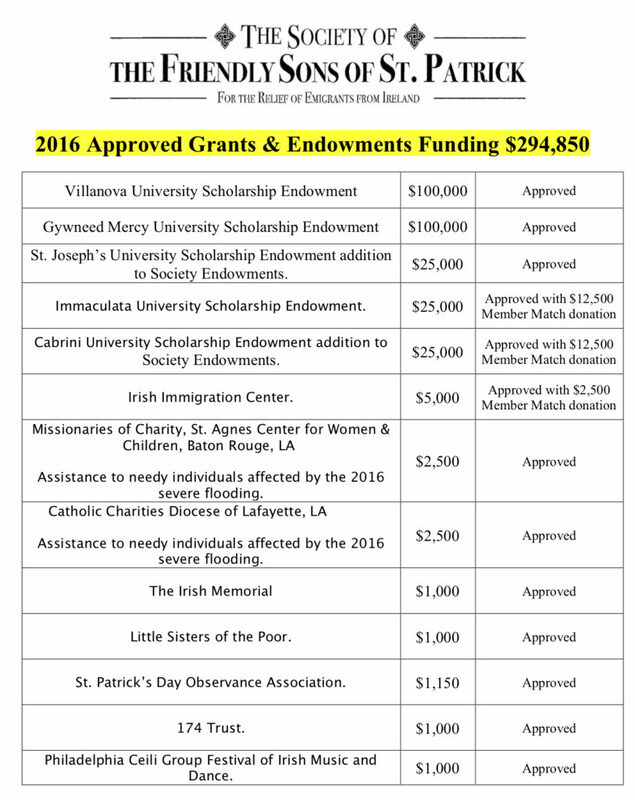 The Cabrini University endowment name shall be The Society of the Friendly Sons of St. Patrick Endowed Scholarship Fund In Memory Of Saint Frances Xavier Cabrini – Patron Of Immigrants. 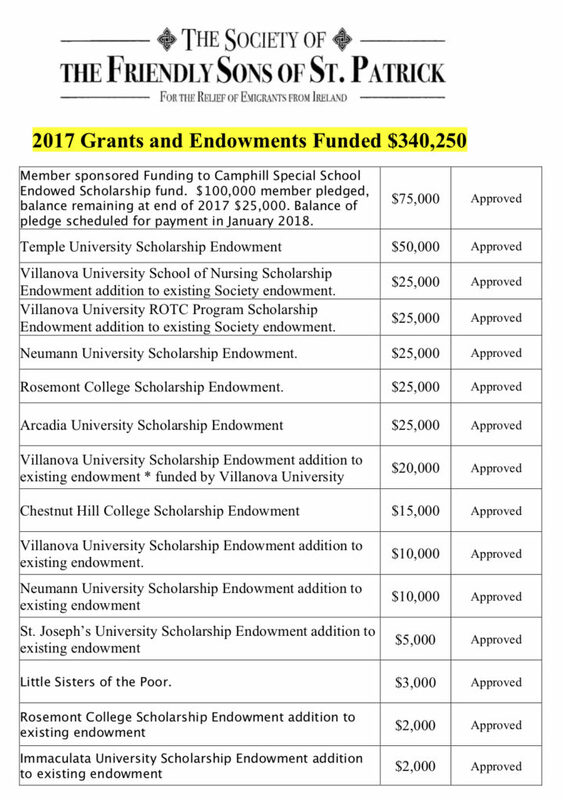 Both endowments will carry the same or similar language drafted in the current Friendly Sons of St. Patrick’s endowed scholarship programs. 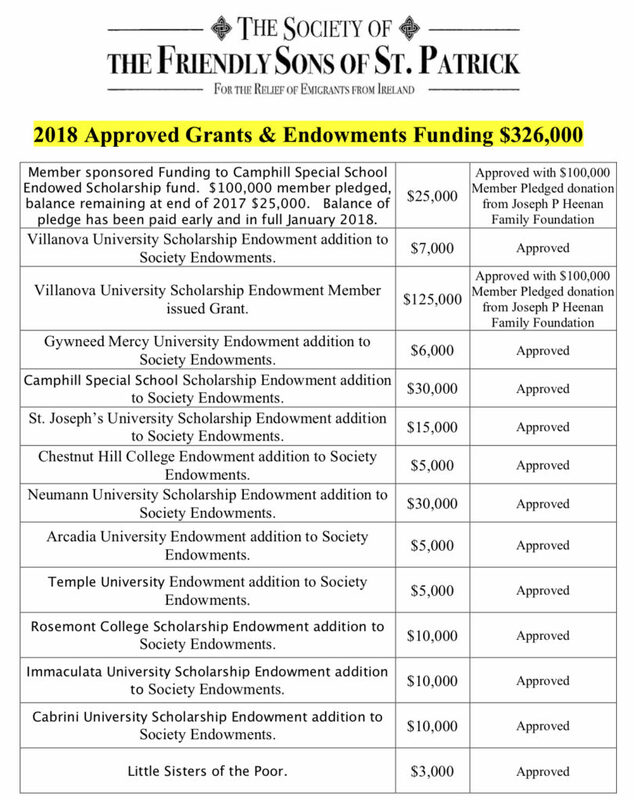 The $100,000 balance paid, $25,000 per year over the next four years will be to establish an endowment scholarship fund for Camphill Special Schools (a local non-profit school run for children with special needs such as autism). 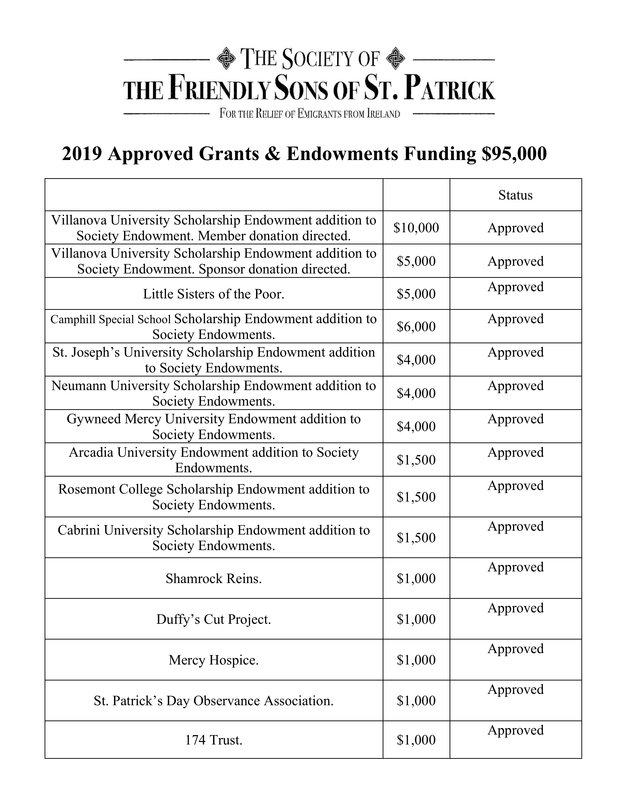 The Camphill Special Schools endowment name shall be The Society of the Friendly Sons of St. Patrick Endowed Scholarship Fund For The Support Of Children In Need. 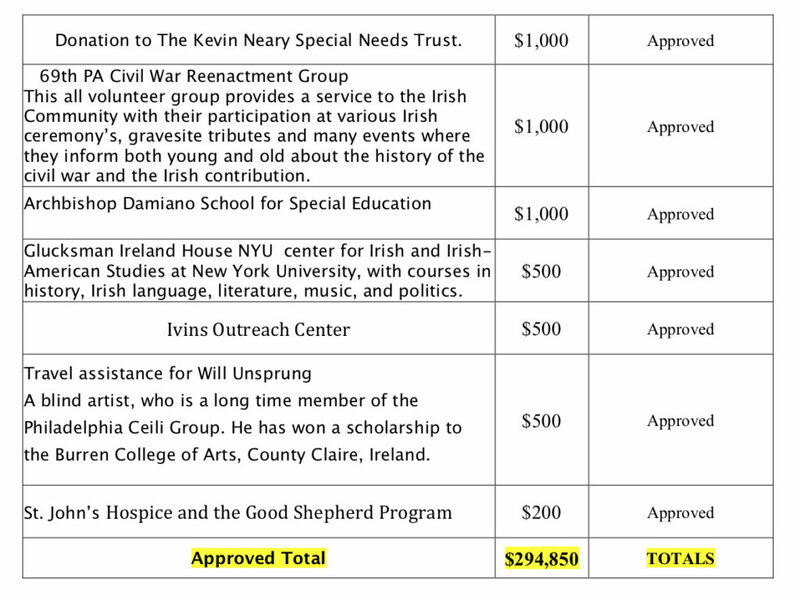 The name of the donor of this grant will not be attached to the endowments, these will be endowments owned in perpetuity by The Friendly Sons of St. Patrick.